The second map pack, Majestic, has finally released for Halo 4 and the design is almost the polar opposite of the previous pack Crimson. Landfall, Monolith, and Skyline fall into the smaller arena style maps category and lack the vehicular chaos found in the Crimson map pack. 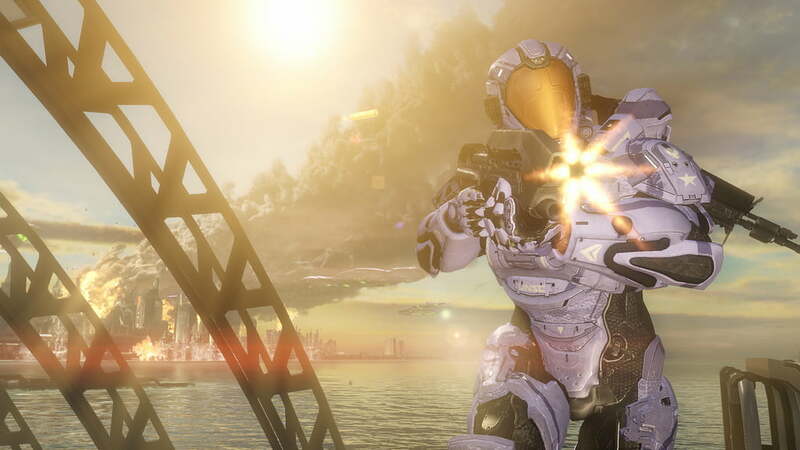 The second map pack, Majestic, has finally released for Halo 4 and the design is almost the polar opposite of the previous pack Crimson. Landfall, Monolith, and Skyline fall into the smaller arena-style maps category and lack the vehicular chaos found in the Crimson map pack. The maps are suited for free for all matches and small team objectives numbering about 8 players. Majestic brings a more classic Halo feel to a game where a majority of the base maps favor the big team style play. Landfall is the largest of the three maps and takes place at the port authority of Casbah, the capital city of the war-torn world of Tribute. The background vista of Landfall is quite beautiful and has a lot of action with civilian ships escaping and the Covenant attacking. The map is split into interior and exterior areas by two large buildings creating two very different styles of gameplay depending on where you are. Close quarters combat is the name of the game while inside as the interior features two floors and a lot of transitions between them creating a constant sense of being vulnerable. The exterior features open an map with long lines of sight allowing the ability to play the long game and pick players off from a distance. The interior and exterior will provide cover in the form of vehicles and shipping containers. Monolith takes place around a Forerunner monument located on an asteroid. The background vista of this map provides an incredibly detailed view of being in an asteroid field. The map draws inspiration from more classic Halo maps by being extremely symmetrical and lacking object based cover. Multi-level spire like structures lie on each side and the center of the square map, two of which have man cannons to shoot players to the opposite side. Running underneath and inside the structures allow a small bit of close combat play while the rest of the map becomes a sniper playground with views that cut from one side of the map to the other giving access to pick off other players skirmishing. Skyline is another symmetrical map that takes place on top of a space tether construction site high above the city of Cascade. Cascade’s skyline background vista is stunning much like the other two maps. The map features high and low spaces with plenty of cover perfect for a good match of free for all or regicide. It is easy to get snuck up on due to the large amounts of nooks, crannies, hiding spots, and ramps. Action tends to be fast and furious on Skyline due to the smallish nature of the map especially compared to the larger Landfall map. While aesthetically the three maps are very different, they all share the theme of being smaller maps with multiple levels of attack. Each one feature gorgeous background design that is a shame to miss due to the hectic faster pace of the gameplay. The maps may be pretty but you won’t notice due to the paranoia of just who might be behind you, above you, or eyeing you through their scope across the map. These maps are a nice change of pace from the vehicular carnage of Crimson and truly harken back to some of the classic Halo maps like Pit or Guardian.